1.9 How To Apply For The UUHF Recruitment 2019? Candidates can apply for the (Uttarakhand University Of Horticulture & Forestry) UUHF Recruitment 2019 Notification with 74 vacancies Additional Director, Joint Director, College of Forestry, Ranichauri, Tehri Garhwal (Professor, Associate Professor, Assistant Professor), College of Horticulture, Bharsar, Pauri Garhwal (Professor, Associate Professor, Assistant Professor), College of Hill Agriculture, Charbatia, Jakholi, Rudraprayag(Professor, Associate Professor, Assistant Professor), Institute of Food Science & Technology, Majri Gantt, Dehradun (Professor, Associate Professor, Assistant Professor), Institute of Medical & Aromatic Plants, Gairsain, Chamoli (Professor, Assistant Professor) Posts. On this page, we had given the details of UUHF Recruitment 2019 Notification. Applicants who are interested in this uuhf.ac.in Jobs 2019, they can apply from 14th January 2019 to 18th February 2019. Here, all the applicants can get more details on UUHF Recruitment 2019 such as educational qualification, age limit, post-wise vacancies, the simple set of instructions to download the notification, and others. Applicants who are ready to apply for this notification, you can check the information of educational qualifications for UUHF Recruitment 2019. (i) An eminent scholar with M.Sc/ Ph.D qualification(s) in Agriculture/ Horticulture/ Forestry/ Concerned/ Allied/ relevant discipline and published work of high quality, actively engaged in research with evidence of published work with a minimum of 10 research publications in the peer-reviewed. (ii) A minimum of ten years of teaching experience in university/ college as Assistant Professor/Associate Professor/ Professor, and or research experience at an equivalent level at the University/ National Level Institutions with evidence of having successfully guided doctoral candidate. An outstanding professional, having a Ph.D. degree in the relevant/allied/applied disciplines, from any academic institutions (not included in A above)/ industry, who has made a significant contribution to the knowledge in the concerned/ allied/ relevant discipline, supported by documentary evidence provided he/she has ten years experience. (i) A good academic record, with a Ph.D. Degree in the concerned/ allied/ relevant disciplines. (ii) A Master’s Degree with at least 55% marks (or an equivalent grade in a point-scale, wherever the grading system is followed). (iii) A minimum of eight years of experience of teaching and/ or research in an academic/research position equivalent to that of Assistant Professor in a University, College or Accredited Research Institution/industry with a minimum of seven publications in the peer-reviewed. (i) A Masters degree with 55% marks (or an equivalent grade in a point-scale wherever the grading system is followed) in a concerned/ relevant/ allied subject from an Indian University, or an equivalent degree from an accredited foreign university. (e) The candidate has presented at least two papers based on his/ her Ph.D. work in conferences/seminars sponsored/funded/supported by the UGC / CSIR / ICAR or any similar agency. The fulfillment of these conditions is to be certified by the Registrar or the Dean (Academic Affairs) of the University concerned. (iii) NET/ SLET/ SET shall also not be required for such Masters Programmes in disciplines for which NET/ SLET/ SET is not conducted. Applicants who are interested to apply for this notification, they need to check the full information of age limit for Uttarakhand University Of Horticulture & Forestry (UUHF) 2019 notification. 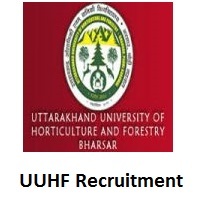 The higher authorities of Uttarakhand University Of Horticulture & Forestry (UUHF) had provided the Selection Process for UUHF Recruitment 2019 as below. How To Apply For The UUHF Recruitment 2019? In that go to the vacancies section, which is the left of the home page. Next search the UUHF Recruitment 2019 link. Then click on that, and download the UUHF Recruitment 2019 Notification. Read the complete details of UUHF Recruitment 2019 notification carefully, if you are eligible then fill the apllication form. Again recheck the application form and then submit to the given address. Take print out of UUHF Recruitment 2019 application form for further reference. So, if any of the candidates want to query us regarding the UUHF Notification 2019, then they can simply leave a comment in the below comment section. Check the latest updates only on our Sarkari Recruitment.